Voice tracking is a way of life for most radio stations, programmers and air talent. Voice tracking doesn’t have to be negative. It can be a useful tool to have key talent on the air more often and to keep the station sounding consistent on weekends and holidays. Voice tracking the right way can not only make you sound live, it can free up talent to do other duties to make your radio station even stronger. – Always cut your voice tracks as close to the time they are going to run as possible. This will put you in the right frame of mind for your show. – Live shift or voice tracked? They need to sound the same. Be consistent. – Don’t wing it. Always prep and prepare BEFORE the show. Just like when you are live, bring your show prep and use it. – If you fumble or make a mistake, leave it in. It will sound more live and real this way. Most likely your live show isn’t perfect, your voice tracks don’t have to be either. – Find ways to reference the time. You can say “coming up in the next ten minutes before 1 o’clock I’ve got…” or “a few minutes after two.” Simple tricks like this will make you sound even more live. – Be topical and in the “now.” Talk about things happening in your area while you are on the air. If there is an event happening while you are on the air, say “that baseball game is set to start here in about 10 minutes at 1.” Little, simple lines like that can make you sound totally live and connected. – Reflect your day part. If you are tracking midday’s talk about being at work. If you are tracking afternoons, keep in mind people are ending their workday and heading home. Tracking overnights? Most of your listeners are working a third shift or can’t sleep. Talk to them. Simple words will help you connect with what listeners are doing in different day parts. – Have a three-ring binder that has all the exact same promo copy, liners and station information that’s in the studio for the live shows. Consistency is key. – Never feel the need to say the day of the week (“…with you on a Monday”). It doesn’t make you sound any more live to say the day of the week. You just create useless words by telling people something they already know. – Think of your voice tracks as “a show”, not “a shift.” This goes for when you are live as well. – If you have the technical capabilities to run phoners, do it. They will make the show sound extremely live and help connect you to the listener. – Don’t rush through your tracks just because you’re not live. Your voice tracks are just as important as any live show you do. Take some pride and put forth some effort in your voice tracks. A little extra work can make good voice tracks great. John Paul is the General Manager/Program Director at KLOG, KUKN and 101.5 The Wave in Longview/Kelso, WA. 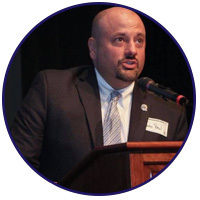 Previously John was the VP/Programming at Westwood One Radio Networks and held programming positions with CBS Radio in Portland, OR and Buffalo, NY, where he programmed #1 stations in both markets. John also did talent coaching and special projects with Albright & O’Malley Consulting and taught an Integrated Media Class at Mt. Hood College outside of Portland OR. John is a fan of voice tracking and has had years of ratings success utilizing voice tracking the right way. John can be reached at johnnypaul@hotmail.com.